To address the problem of deteriorating air quality in India, South Korean giant LG has launched today its Air Purifiers range- LG PuriCare. The USP of these state-of-the-art Air Purifiers is that they offer powerful filtration that reduces the harmful substances in the air, thereby keeping the room fresh and clean, apart from being stylish in their design. 360 degree purification – Equipped with unique 360 degree purification, it not only makes the interior space beautiful, but also absorbs pollutants from all directions. Its Axial-Centrifugal fan, and Guide vane with Chevron Nozzle makes it 20% extra powerful, compared to conventional air purifiers. Powerful Clean Booster – The innovative clean booster feature in LG Puri care helps maintain a clean air flow up to 7.5 m away by creating a circulating air stream. It helps to distributes all of the clean air with rotation of clean booster throughout an entire room. 6 – Step Filtration For Complete Protection – These range of air purifiers have powerful filtration which purifies the space with qualified 360° filters. These 360° filters get rid of micro particles, harmful gases and odors effectively. The inflow air goes through the filtration system which has 6 step filter that eliminates various kinds of dust and harmful gases. 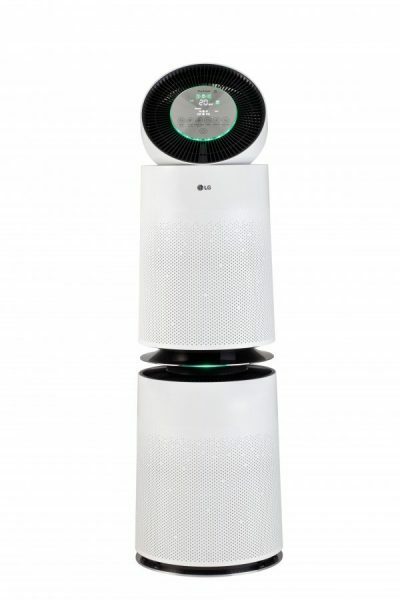 PM 1.0 Smart Sensor & Display – LG Air Purifiers provide a real-time reading of your indoor smell and ultra-fine dust with its smart PM 1.0 and gas sensor that automatically sets the air flow and operation cycle. The Smart display is the lighting system which shows different colors based on the pollution level. Baby Care Mode – LG PuriCare delivers clean air at the low places where babies stay with independently working lower duct and also cleans bottom air close to the floor intensively softly. Smart ThinQ – LG PuriCare Smart ThinQ helps to check pollution level and control the air purifier from anywhere. This feature also enables the users to check filter lifespan of your Air purifier. Quite Operation – With the Smart Inverter one can enjoy clean air while the room remains peaceful and quiet. Its quiet operation can keep noise levels as low as 20dB and still keep the air fresh. Smart Display – One can easily check air quality from a distance or at night with Smart Display, which shows air quality levels by 6 different lighting colors.